It seems that I make a lot of recipes similar to this one. I love dishes like this because they are so good the next day, cold or at room temp. This recipe is from Cooking Light (Aug 2012). Look away Melissa, I bought the pie crust. (You’ve all seen her posts.) I used tomatoes from the farmers market and the basil from Matt. I liked this tart because it also uses fontina cheese. My new favorite. Melts like butter! 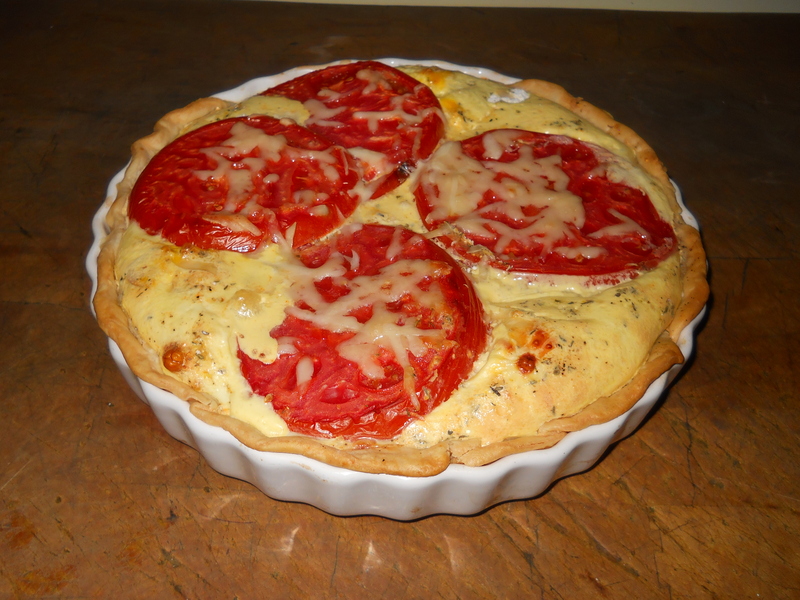 Basically the recipe is eggs, milk, cheese, shallots, tomatoes , fresh thyme and basil. Next time, I think I will add some greens to it. I still have some purple potatoes to use. I have steamed & roasted them quite a few times this summer. Any ideas out there for something different to do with them? Thanks! This entry was posted in General on August 9, 2012 by andrewsbeth. That looks delicious! I love fontina cheese, and you can’t go wrong with tomatoes and basil – yum! That really looks great. I could sink my teeth into something like that. Thanks Melissa!! I know you love that cheese too. Thanks Sandy, I’ll make that at the lake sometime & the men can grill something! 🙂 See you soon!! That looks so good! I will make that next week with the tomatoes I hope we get! Cooking Light I have!